It seems like a simple thing, to put a tiny button that allows people to know when we’ve written something new. Yes.. sort of. We have a button, but I’m not yet sure how it works. If you want to sign up while we’re sorting it out, be welcome.. and let us know if it doesn’t work. Thanks! On Cleaning Day, We Do That. Saturday is cleaning day, which is a Vast Improvement over the previous state of affairs, where the person that was the most grossed out by a tiny hint of bathroom-mung was the one that cleaned the bathroom. Instead, we get together for about 2 hours on Saturday morning, play music (today, some kind of early-90s mix including House of Pain, which was strongly reminiscent of Much Music Dance Parties in Junior High), pick one of a number of different jobs, and CLEAN. It works pretty well. I think that everyone cleans a bit more thoroughly than they would have otherwise, because we each know that we only have to do it for a specific period of time, and when we’re done the rest of the house will be cleaned, too. The kids participate, mostly, and we all get that nice feeling of having worked together to accomplish something. This week, I picked Laundry/Sheets/Etc, which meant that I had to find things to do in between loads of laundry, which is how I found myself washing the cord of the laundry spinner. 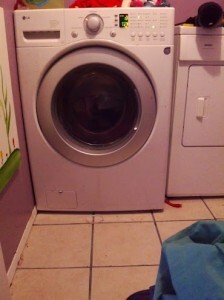 A laundry spinner is a miraculous device that removes excess water from the laundry by spinning it at a much higher velocity than a washing machine is able to do. It does not function better if its cord is washed, and the cleanliness of the room is not significantly enhanced, if the cord is washed. I am not the kind of person that walks into the room, and notices if any given power cable is a bit dirty.. or even if the room is dirty, really. But such is the power of Cleaning Day, that even the power cords get washed. One does more than one would otherwise do, because everyone is pitching in. The pressure cooker has become an essential part of feeding 10 people cheaply. At first, I was a little concerned about explosions (and associated people becoming drenched in super-heated soup), but as it hasn’t happened yet, I’ve lowered my guard. Tonight, we’re trying a dahl recipe, to eat with baked potatoes. Due to the variety in people and palates, we often serve two meals that have a DIY component to them: build-it-yourself burritos, and baked potatoes with lots of fixings. To mix it up a little for the sake of the adults, sometimes the potatoes have a chili option, and sometimes a dahl option, but the kids usually prefer yoghurt and bacon bits. Here’s what we’re trying tonight: http://norecipes.com/masoor-dal/ . We are two families and one bachelor, who decided that we were done with the rat race and curious about exploring the feasibility of living in a way that was more in line with our values. We are concerned about food security, climate change, and the negative impact our lifestyles are having on the world. Some of the parents wanted to spend more time with their children, and some of the parents wanted to spend more time in the company of other adults: thus the Mad Plan was born. We toured parts of BC, met some wonderful people that showed us the best of where they live, and did their utmost to convince us to be their neighbours; we wanted to live next to all of them! In the spring of 2013, however, we went to Sooke, and fell in love. We loved the people we met, we loved the proximity to family, and we loved the way that, if a person even seemed to hint at wanting to cross the road, cars stopped. A long growing season, plenty of moisture (for the west-coast-born moss-dwelling rain-lovers in our crew), and a vibrant local food movement sealed it; Sooke was the place for us. 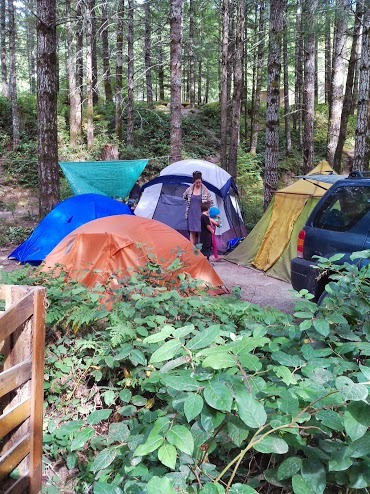 In the summer of 2013, each family sold their house in Coquitlam, shed many of their worldly possessions and packed the rest into a shipping container, and moved to the Sooke Potholes campsite. After a few weeks, we met a lovely person that was agreeable to us camping on her lawn and sharing her kitchen and bathroom. Living outside got colder, darker, and wetter, and though the moon was lovely and the company congenial we decided that we’d rent a house in Sooke for the winter. 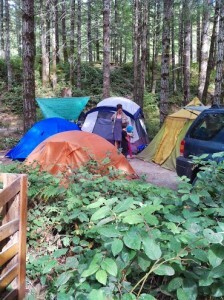 It was very exciting to have access to a washing machine, after camping for weeks. In our minds, we would move to Sooke, find property to buy, and then.. have a wonderful life. The inbetweenness of this current time, once we’d sold our houses but not yet bought anything, was not a big part of our planning. Living in close quarters is working well, and provides lots of opportunities to talk about plans and dreams, work on our social contracts, and learn to live together. This house, however, is not where we plan to stay, and is definitely a little cramped for 10 people. We all want to start building and digging, growing and learning; living in this liminal space is an exercise in patience. We have a few properties in Sooke that we’re looking at, but we’re all wanting to get a few details ironed out before we make any offers. We are all getting along well, given the close quarters, but we all want to know what will happen if someone decides that they want to leave. We also want to have a legal structure to buy the land, and to figure out how (should they want it) we can easily pass ownership on to our kids. We initially thought (due to the advice of our marvelous and thorough family lawyer) that we would go with a generic corporate structure, but after talking to the BC Co-op Association and a lawyer that was more knowledgeable about co-ops, we are thinking that a co-op structure would suit our needs better. We’re talking to an accountant to see how to best meet our need to avoid unnecessary paperwork, and a Co-op Developer to help with figuring out the legal structure. 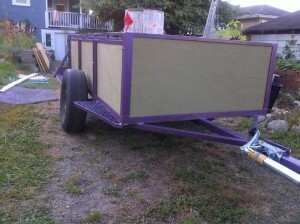 And soon, we hope, we will be done with all this boring stuff and on to actually Getting Started. And that’s where we are, right now. Are you thinking about doing something like this? Do you know of anyone we should talk to? Want to correct my use of The Semicolon? Comment on, folks, comment on.